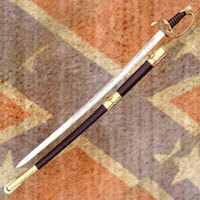 1840 NCO Swords are made with the same specifications as swords carried by the US military for over 70 years. 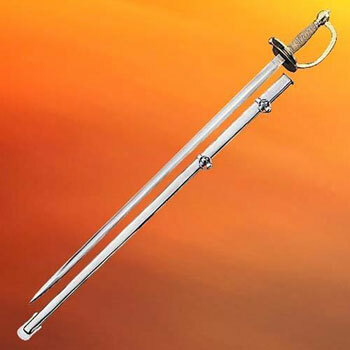 These non commissioned officer swords feature a single edged blade. The 31 ¾ inch high carbon steel blade has a single broad fuller that begins near the point and ends at the ricasso. They have a ribbed grip. The whole hilt is crafted of cast brass. Like the swords carried by the US military during the Mexican War, Civil War and Spanish American War, these swords have a global pommel with capstan. Still popular today, the 1840 NCO Swords have a kidney-shaped hand guard on the grip. They are made in India and include a matching steel scabbard with hanging rings. 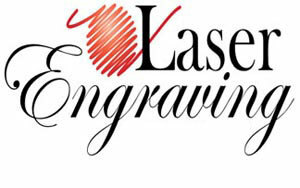 They can be sharpened for an additional fee. 1860 Light Cavalry Sabers are 41 inches in all. These 1860 Light Cavalry Sabers feature a hand forged British military spec steel blade, a real leather wire wrapped handle and a steel scabbard. The 35 inch blade will flex over 20° and return to true. The 1065 high carbon steel blade is 1 1/8th inch wide and 3/16th inch thick. These swords are handmade in India and weigh 2 pounds 5 ounces. The steel scabbard weighs 1 pound 10 ounces and features hanging loops. These premium quality military swords are available unsharpened or sharp. 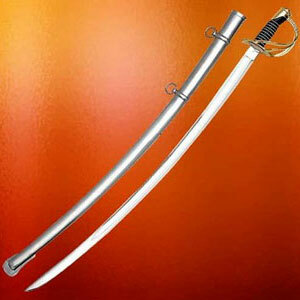 1840 Heavy Cavalry Sabers are 41 ¼ inches in all. 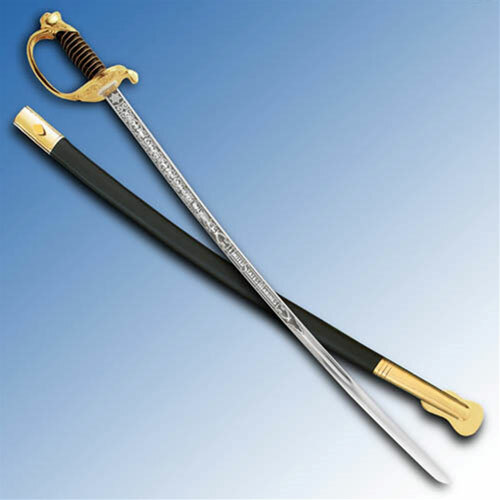 The model 1840 Heavy Cavalry Sabers feature a 1065 high carbon steel blade, real brass guard and the wrist breaker sword design. 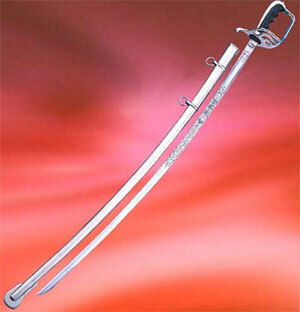 These full tang swords feature a 35 ¾ inch 1065 high carbon steel blade that is 1 ¼ inch wide and 9/32nd inch thick. 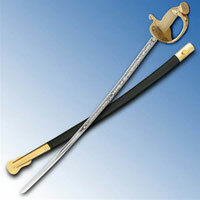 They feature the traditional three branch brass guard and a black real leather grip with brass wire wrap. These popular swords are handmade in India weigh 2 pounds 5 ounces. They include a steel scabbard with hanging loops. 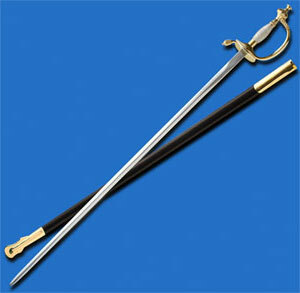 Model 1860 Union Cavalry Swords are 39 inches in all and weigh 2.19 pounds. 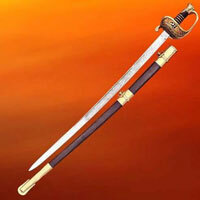 These sabers are inspired by real military swords and feature historical blade etchings and engraving. The functional 33 inch unsharpened blade is hand forged in British military spec steel that will flex to over 20° and return to true. The handle features a real leather grip that has a traditional wire wrap. 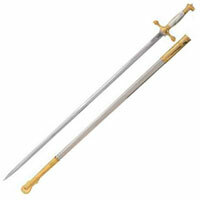 The brass pommel and brass three branch guard is hand chased and engraved. The 1065 high carbon steel blade is engraved with US and E Pluribus Unum. The blade also features an ornately etched pattern of foliage and military trophies. The steel scabbard has polished accents including a brass throat, rings and drag. 1850 Union Army Staff and Field Officer Swords are 35 inches in all. These sabers are inspired by popular military swords that were carried by officers during the American Civil War. This modern version features a 30 inch hand forged blade that will flex over 20° and return to true. The British military spec steel blade is etched with foliage and military trophies. It is also etched with the initials US, E Pluribus Unum, and Iron Proof. The handle features a genuine leather covered grip and a traditional wire wrap. The brass guard features hand chased foliage and the letters US between the branches. These swords have a brass pommel. The blued steel scabbard features contrasting polished brass accents. 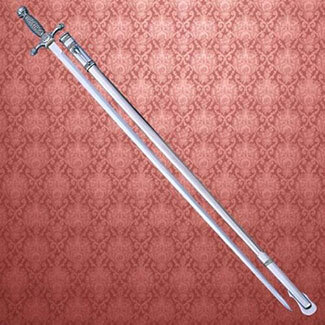 U.S. 1860 Naval Cutlass Swords are 31 ½ inches in all. These swords feature a high carbon British military spec steel blade that will flex over 20° and return to true. The leather scabbard features a brass tip and throat and features a real leather frog. They have a 25 ½ inch blade and a genuine brass basket on the hand guard. U.S. Air Force Officer Sabers feature government specification etchings and a highly polished stainless steel blade and polished scabbard. They have a ribbed handle and are topped with a highly detailed globe shaped pommel. The handle features US Air Force etchings. 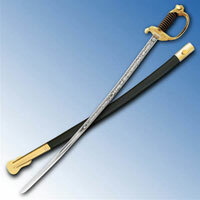 U.S. Army Officer Swords are available in several blade lengths for a personalized fit. 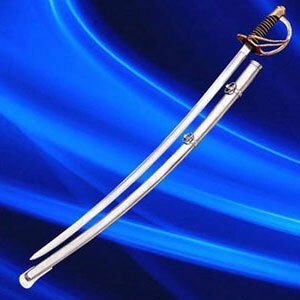 These military swords feature a stainless steel blade that is polished to a mirror finish. The blade has appropriate military etchings. They have a black composition handle with finger grooves. The hand guard, pommel and scabbard are crafted of polished steel. The scabbard features hanging rings. 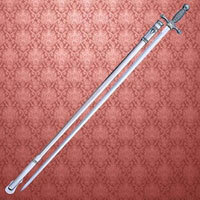 These popular swords include a cloth storage sleeve. Contact Customer Service via telephone or email for available sizes at the time of purchase. US Army NCO Swords are available in a variety of blade lengths to provide a customized fit. These swords feature a tempered stainless steel blade that has been hand polished to a mirror finish. The 24kt Gold plated pommel and 24kt gold plated guard fittings are made of intricately cast solid brass. The grip features a silver-plated brass wire wrap. 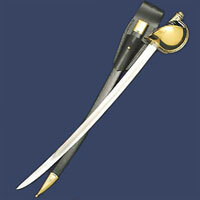 The black real leather covered scabbard features 24kt gold plated brass mounts. These military swords include a cloth storage bag. Contact Customer Service via telephone or email for available sizes at the time of purchase. USMC NCO Swords feature a 30 inch blade. 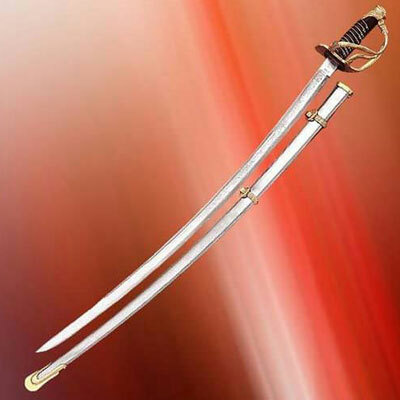 These popular premium edition military swords have an unsharpened highly polished stainless steel blade that is etched with United States Marines and decorative scrolls. 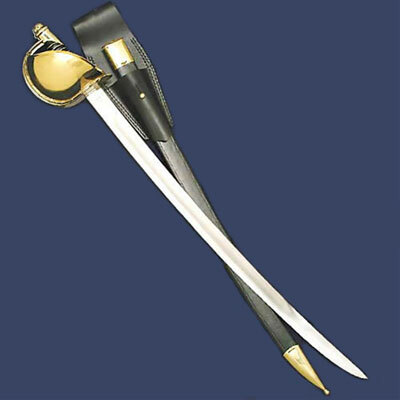 These swords are manufactured in Spain and include a black leather wrapped scabbard. They are crafted to the Marine Corps Technical Manual TM10120-15/2 and certified by Marine Corps Systems Command with the certification number etched upon the blade spine near the hilt. They have a black leather grip with a gold wire wrap. These popular military swords also include a gray flannel storage bag. They also have the standard placement box for personalization. Contact Customer Service via telephone or email for available sizes at the time of purchase.